Wet Wednesday- a karma courtesy? They say that instead of exacting revenge of someone who has done you wrong you should wait for karma instead. You can sit back and watch someone get their “just desserts.” Well today it seemed that karma waited for me; in the form of Mother Nature. And she got me good; proper good. Soaked to the skin numb, ruined possessions and mortified good. Sometimes the American people one meets during life in the USA are hard to believe. Some people genuinely believe us English folk “love the rain” just because we’re known for our awful weather. Mate, are you mental?! Of course I don’t “love the rain.” It’s just something we learn to expect in England; whether the weather forecast says it will happen or not, us English folk know that it can happen at any given moment. However, I wasn’t expecting this today in Hattiesburg, Mississippi. It has been bitterly cold here in recent weeks. Would you understand what I meant by a “different type of cold?” It’s the same cold I experienced when I was staying in Melbourne, Australia from Gold Coast, Australia. Those days where although I’m sensitive to the cold because of my thyroid disorder, the Melbourne nights hurt; so much so I went to sleep with a hot water bottle, 3 blankets and the previous days clothes over my pj’s. That’s how it’s been here. I find going outside to be a horrible experience and am quickly maneuvering myself back to the safety and warmth of the indoors. When I finally decided to rise from my bed (aka a pitiful mattress on the floor) I could hear the rain outside my window and decided to save working out until the evening. It wasn’t raining too bad from what I could tell so I did some Uni reading and then decided to save myself time later by putting my gym kit on now and going straight there after class. As I was about to leave Jana returned and labelled today’s weather as “disgusting.” This made me laugh. It felt like a personal opinion and complaint at the same time. As I put my nice Nike gym trainers on though and looked out the window of my apartment I also felt an impending sense of doom. But I had no choice. If I wanted to eat today I had to leave the apartment and I regretted giving Elizabeth her broken umbrella back last week. Not that it would have helped me save my shoes today. With my iPod on I scurried out into the downpour. It was literally tipping it down. It was “raining cats and dogs” as the idiom goes. The pavements were flooded and instantly my trainers were filled with water and my skin turned a painfully numb shade of “berrie red.” I learned quickly that my Christmas present Leicester City FC coat was great at keeping my warm but not dry in severe downpours like this. Within minutes I was ringing water out of my coat as I quite literally became soaked to the skin. In all of 10-15 minutes my day had changed swiftly. As I got to the cafeteria I was mortified to be leaving puddles everywhere, everything I was wearing was wet including the possessions in my pockets and the contents of my rucksack. I ate brunch with a “face like thunder,” for my body was paining me and I felt uncomfortable in my own skin. The Americans were apologising to me, I don’t know why they felt the need to but soon as I got there I’d decided that there was no way I could sit in class like that. I bought dinner and headed home after 30-40 minutes since leaving the apartment. I was not a happy bunny. But I was a soaking wet one. The rain had slowed a bit now (sod’s law) but I was just desperate to get home so I could shower and change. I walked past these guys and one of them says to me “how are you doing this? !” to which I replied with a sigh “I’m from England. But you’re not prepared for this kind of weather like we are and I can’t afford to ruin another pair of shoes. So sod the LAB, I’m going home.” As soon as I said “England” in my accent they started the whole “omg you’re from England thing” which I wasn’t in the mood for and quickly walked off. All the pavements were flooded and there was mud also swimming in my shoes too. As I opened the door and told and showed Jana about my eventful walk she agreed that I had made the right choice coming back home instead. She also said how America isn’t as prepared as we are in Europe. You just couldn’t avoid the puddles if you tried. I already have bad circulation and as soon as I began to strip off I got that burning feeling when you go from one extreme to the other and my hands swelled when I got into the warm shower. It’s gonna take me a while to get warm- I have this dilemma every night which is why my sleeping pattern is messed up. 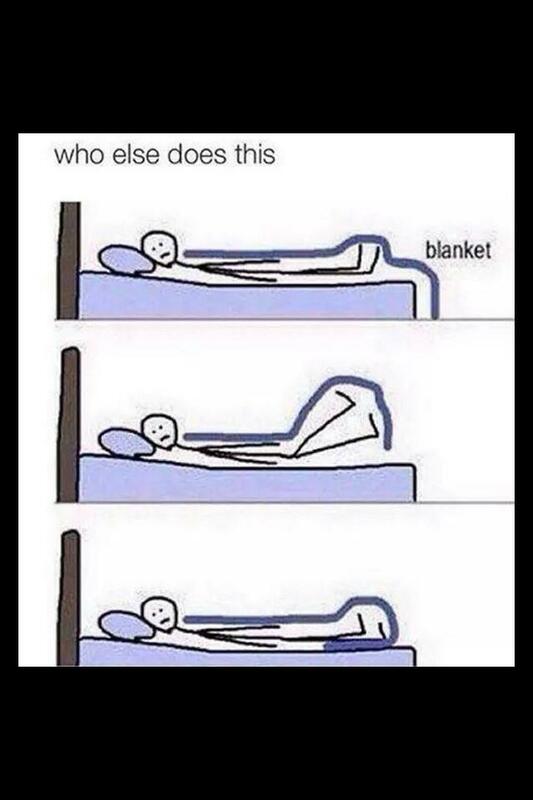 -Me right now and how I sleep everyday.